Like in many aspects of life for every idea and design that stand the test of time there are ten times the amount that fail to take off, simply don’t work or they become obsolete. Whilst some of this comes down simply to a bad idea, others reasons for failure is the new designs fail to obey the notion of Occam’s Razor where each time we shave something off a design it should become simpler not more complicated, and at the same time more rather than less useful. As such some ideas were destined to go the way of the Dodo. There are many ways ideas fail to come to market, however the first piece of kit the Petzl Tri-bloc a lightweight ascender, has not only made it to market but does pretty well for a small lightweight rope ascending device. However pre-dating this is the Wild Country Ropeman, which was actually designed by the same person who invented the Blizzard survival bag, which is found under every seat in the US military vehicle. When Derek designed the Ropeman, he also came up with an idea that was almost identical to the Tri-bloc, however he decided the world only needed one design so left that design on the workshop floor and patented the Ropeman. A few years later and the Petzl came to a similar design conclusion and bought the tribloc to market. Not everyone is as good an inventor as Derek though, David Hemsley designed a type of cam and even went to the trouble of getting it patented. Yet unsurprisingly he has since failed to bring it to market, as it basically fails to improve on the designs that came previously and its niche is that it would allow cams to fit in very wide cracks and rather than normal cam lobs it sported some very fetching medieval spikes. There are also many designs of simple climbing chocks that simply never managed to remotely challenge the dominance of the Wild Country rocks, yet still to made it as far as gaining a patent. Although patenting climbing equipment seemed to start in the 1970s and continues to this day. 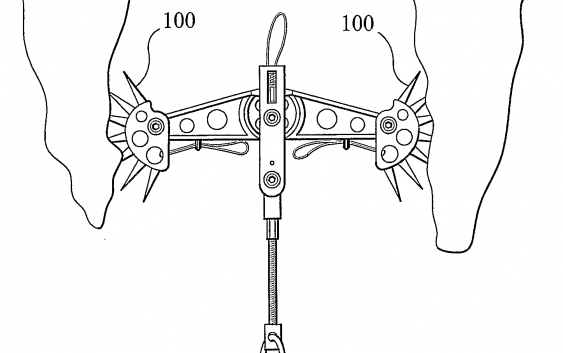 Where people will now patent something as simple as how to attach a sling to a cam. Prior to the battles over intellectual property, climbing was probably a more friendly place, but since it became business many companies go to great lengths to keep their ideas secret whilst they are being developed and again many will fall by the wayside, after all there can only be so many ways to skin a cat when it comes to fundamental designs of equipment. I remember working in Joe Brown’s store in Llanberis in the late 1990s, and upstairs was an old sewing machine at which Joe used to make his own slings for sale. I don’t recommend you try this at home on your mum’s Singer as nowadays there is a set pattern and amount of threads required to make the joins conform to the safety standards. Although I once climbed with a friend who had sewn her own slings by hand, I think I instantly gave her my quickdraw slings knowing I would probably be able to beg some replacements when I got home. Along with his sewing machine was a small collection of what I can only describe as climbing artefacts, or objets d’art. One was what I can only describe as on the one hand being very similar in shape and appearance to Abu Hamza claw but with the weight and feel of a fig of 8. Now many modern climbers won’t even know what a figure of 8 is, after all we mainly use belay devices. But before the modern belay device we had to use the stitch plate, essentially a small piece of metal with a hole in, the posh ones even had a spring. They worked fine, but if you abseiled on them they reached a temperature approaching that of the surface of the sun. So instead climbers used a figure of 8 to abseil which dissipated heat better. However with the advent new technology in the shape of modern tubular belay devices, the figure of 8 and stitch plate have gone the same way as video cassettes, the typewriter and the iconic red phone box. This Hamza claw was an alternative to the figure of 8, which the rope wrapped round and you abseiled on. However if the abseiler lost contact with the rock and spun round then essentially the rope would unwrap itself and you’d descend the rest of the way much quicker than you were expecting. As such it failed to become popular as those that liked it would invariably die using it. However that was nothing compared to the other device there, which was like combining Russian roulette with abseiling, and if you used Hamza claw to descend the rope then you might as well as load two chambers. The device in question had a spring-loaded hook on one end, and a bar on the other end. You tied you rope to the bar and hooked the other over the abseil tat and clicked the whole thing shut. From this point on it was rather like a mousetrap, in that you had to keep the rope weighted, if you didn’t the hook would release itself. So now imagine yourself abseiling down, where upon you find a ledge, as you pass it you could potentially release enough tension as to cause the whole system to release and the last part of the abseil would again be done pretty much in free fall. If you survived that then the device that weighs about 2 kilos would then proceed to land on your head to issue the Coup D’etat. Again a device that was destined to have less and less people use it over time rather than more. There are of course many other extinct designs in climbing and I have just highlights the ones I know of. I may return later to more of the worse ideas climbing has ever had, especially if any readers have more climbing exotica from a bygone age we can share with you.